Congratulations to our Newly Qualified Solicitor, Callum Thomson! 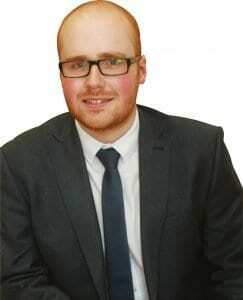 A big congratulations from the Riley Langdon team to our newly qualified Solicitor, Callum Thomson. Callum started with our firm in November 2014 as a Paralegal, before becoming a Trainee Solicitor in February 2015. He completed four years at Northumbria University to obtain his Master in Law (Exempting) Degree, which incorporated his Legal Practice Course. The course provided him with the practical and theoretical knowledge to hit the ground running at Riley Langdon (within 3 hours of starting, he had his first appointment with a Client). His qualification provided him with knowledge and transferable skills from a range of legal disciplines; from interviewing convicted criminals in prisons, to building on his legal theory in Family Law, Business Law, Property Law, Intellectual Property Law, Civil Litigation and others. As a challenge, he based his Masters dissertation on a completely new area of law: Tax Avoidance and the General Anti-Abuse Rule. Callum worked within the highly regarded Student Law Office at Northumbria University, which was awarded the Queen’s Anniversary Prize for exceptional work during his time in the office. Furthermore, he met and spoke with Baroness Newlove when she visited the SLO about her work with Defendants and Victims. Following his four years at university, Callum was required to complete a Period of Recognised Training, previously known as a Training Contract. These opportunities are few and far between. He was successful in his application to our firm and soon became an integral member of the team. Over the two years, he has been involved in a number of diverse cases, within a range of areas from divorce to childcare, to conveyancing, to Wills drafting, to Civil Litigation and others. He has furthered his skills to apply his knowledge to practical situations and he is able to advise thoroughly on the issues that arise. He has a good rapport with Clients and the local community, having been made a member of BNI and therefore integrating with local businesses within the community. Callum has worked extremely hard to get to the position that he now holds. It has been a challenging, arduous, but fulfilling experience and he certainly deserves a celebratory few drinks!